The Dead Letter Drop BBS (aka DLD) is not anymore situated in Muscat, Oman. DLD was the support BBS for free software written or maintained by Jonathan Hudson. But who is Jonathan Hudson ? 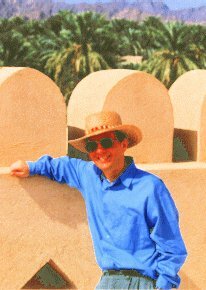 Jonathan R Hudson was working for the Government of Oman in Muscat, when he was not sailing or playing with a real computer. Just once, he got caught here having a sunny day off exploring the historic Nizwa Fort in the Oman Interior. Nice mountains, not much desert !